I got invited by my good friend Andy to visit the old Seaholm power plant in Austin. This plant served the city until 1989 and was officially decommisioned and designated for repurposing in 1996. The building has sat idle for years, but preparations are now underway to turn the property into office and retail space, as well as condos. Unfortunately, the turbines and other equipment have already been removed, leaving behind a shell of a building. Regardless, we found some cool stuff to shoot. Some of the most interesting places to explore were in the catacomb-like subterranean levels. 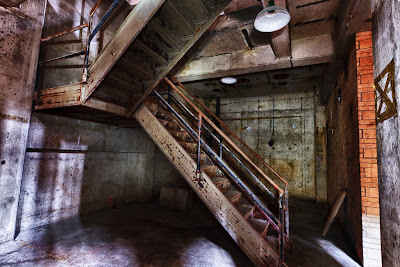 The concrete levels were very dark, lit only by whatever daylight filtered in from windows in the upper level and fell through the holes in main building's floor where the turbines used to sit. This environment presented a challenge, even for HDR capture. In a lot of places, I could barely see and needed a flashlight to illuminate things. My camera was wanting bulb mode and I would have had to push the ISO quite high to get shots in a timely manner. So, I decided to try something new. I'd heard of light painting before, but I'd never tried it myself. This seemed like a great opportunity to give it a go. The basic idea is that you use a long shutter speed and "paint" the subject with a flashlight to light whatever you want to expose. It took only a little bit of experimentation to get some good results. There is definitely skill involved to evenly light things and not leave flashlight "brush" strokes. You also have to look at the scene and figure out where to light. You don't want to remove all shadows and end up with a flat looking image. 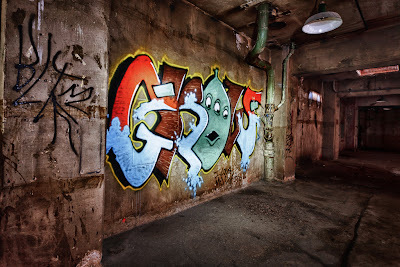 For this shot, I used my flashlight to illuminate the graffiti painted wall during the long exposure. I liked the look I got, but I still wanted to bring out the gritty textures some more. In post processing, I ran the single exposure through NIK HDR Efex Pro. While HDR is generally used to compress dynamic range, it is also great for opening up the textures in an image. Being in this place felt like a creepy level in a video game and I really wanted to communicate that. The tonemapping process brought out the textures, but also increased light levels in shadow areas that I wanted to keep dark. So, just I blended the tonemapped file with the original to help get the lighting where I wanted while keeping the dark shadows as they were originally. This image was a challenge to compose and capture. A little bit of light is falling from above, enough to make out the stair case. The small room behind the stairs was pitch black. I had to use my flashlight to compose and focus the camera. Next, I experimented with a couple of long exposures while painting in the stairs and the background. One nice thing about capturing the scene with light painting was that I was able to keep a tighter aperture for good depth of field. Without the light painting, I would have had to use a wide aperture and higher ISO with excessively long shutter times to expose for the dark room. To get maximum grit, I again used HDR Efex Pro to tonemap the single exposure and blended it with the original to adjust for the best shadow areas. Light painting is certainly a useful technique that I will continue to experiment with as the situation calls for it. It takes a bit of practice to get the fluid movement of the light correct. You have to figure out where to light and how fast to move the flashlight. Check your LCD and histogram after each attempt and see what you are getting. In the areas that you illuminate, check for even coverage to avoid brush strokes of light. It might be a good idea to have a couple of flashlights of different power levels with you. My Surefire flashlight has a high and low mode that I found to be handy. Combined with HDR, light painting is an especially powerful tool in my photography toolbox.